Yes, yes, I know, we are crazy... going to Greece again! Well, why not? 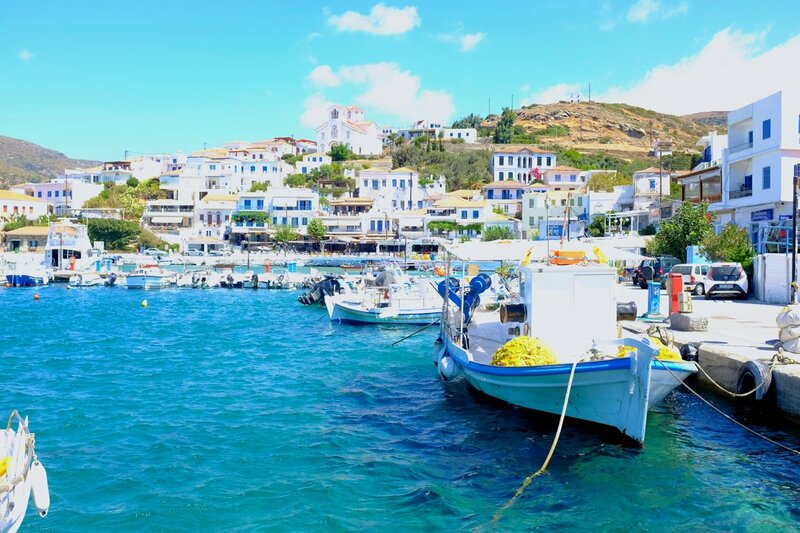 Greece really ticks all the boxes for us - lovely landscapes, rich culture, great beaches and the best food ever. 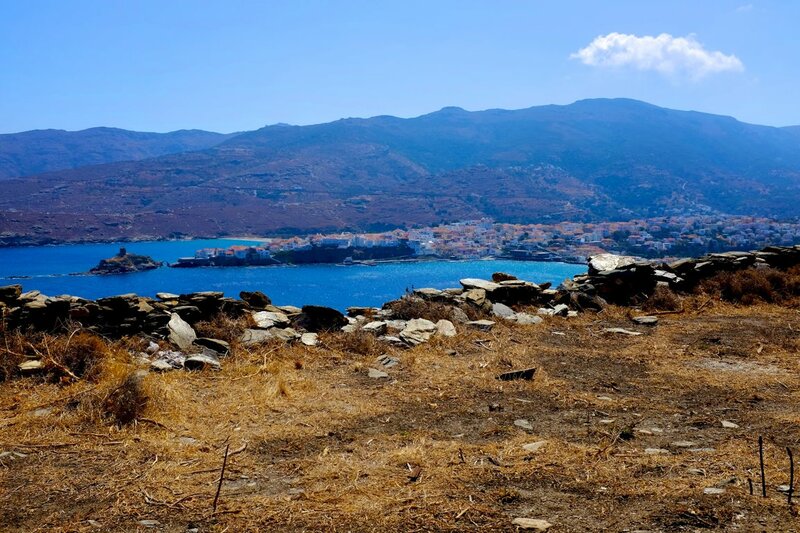 And we are lucky that there are so many islands to choose from :) After some research and consideration we chose to go to Andros - the most northern island in Cyclades. It was supposed to be beautiful and not touristic at all. I confirm. 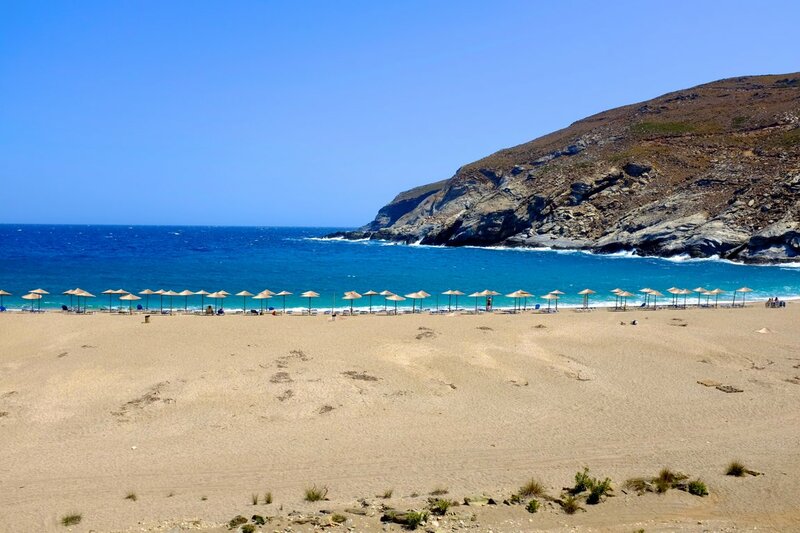 The number of forum posts in Tripadvisor about Andros is around 100 - that's good enough to know that the island is not so popular for tourists - and that's what we were looking for - authenticity. 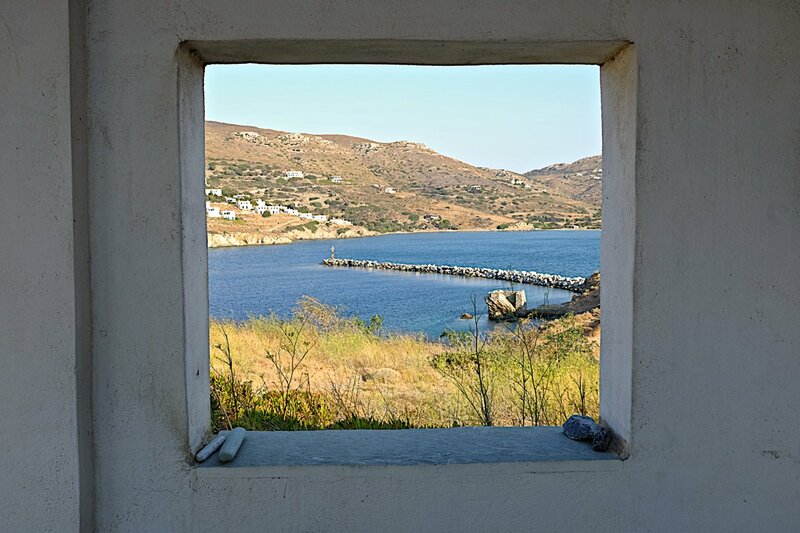 It's easy to get to Andros - ferries depart from Raffina and there are at least 4 a day, early morning or late in the evening. 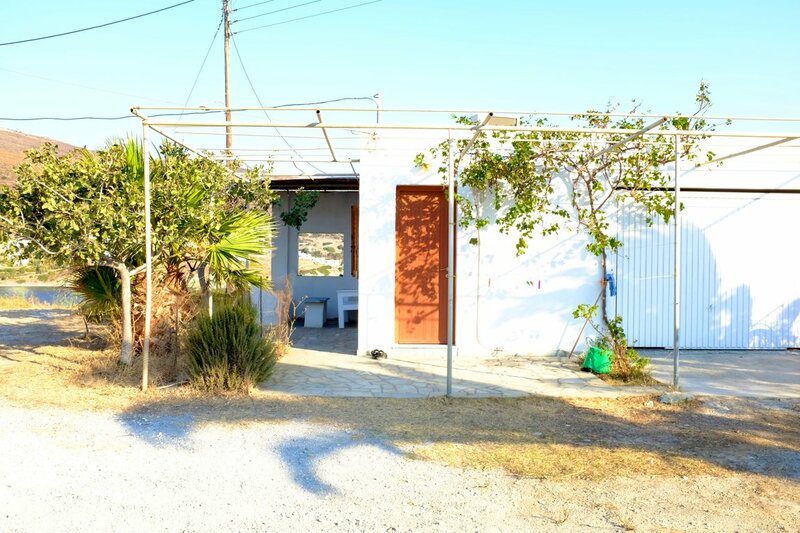 As we were arriving in the afternoon, we did not want to risk missing the ferry, so stayed in Raffina for one night just in front of the port (hotel Avra, they have a free transfer from/to the airport). It also allowed us to figure out how the port works and comparing to the experience in Pireus, it's peanuts in Raffina - see your ferry - get in - that's it :) In addition, there are loads of lovely family run restaurants around and the beach bar was very good too. Blue star ferries are huge! It's really interesting to go on all the decks and just enjoy people watching. 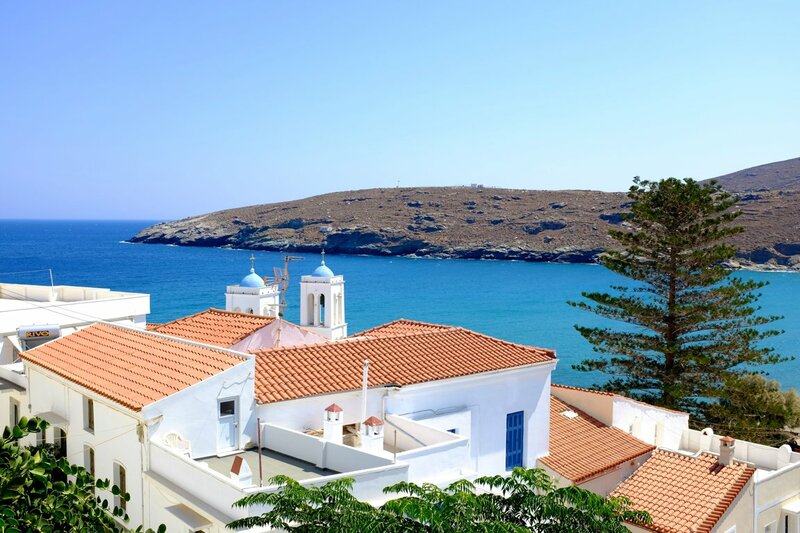 We have a new game - to identify people who are going to Mykonos as it's the same ferry - Andros - Tinos - Mykonos. Not sure how accurate our guesses are but it's fun. 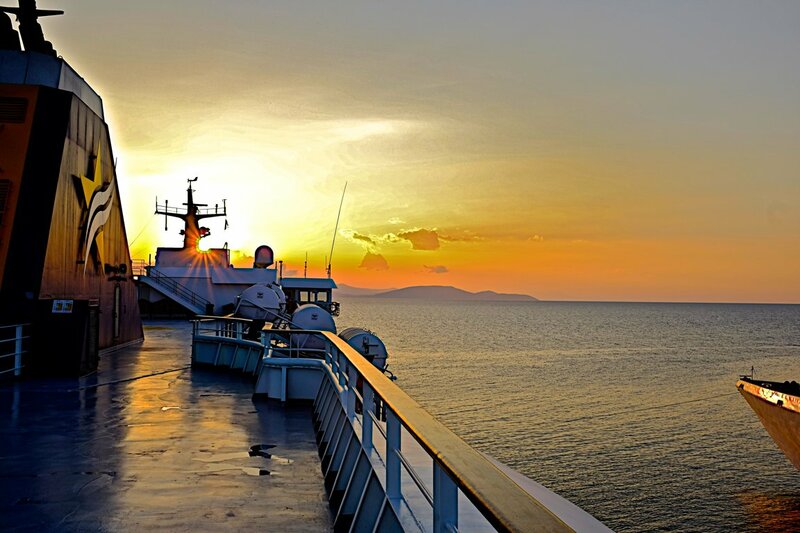 We also notice that there are mostly Greeks on the boat - and that's a good sign, right? 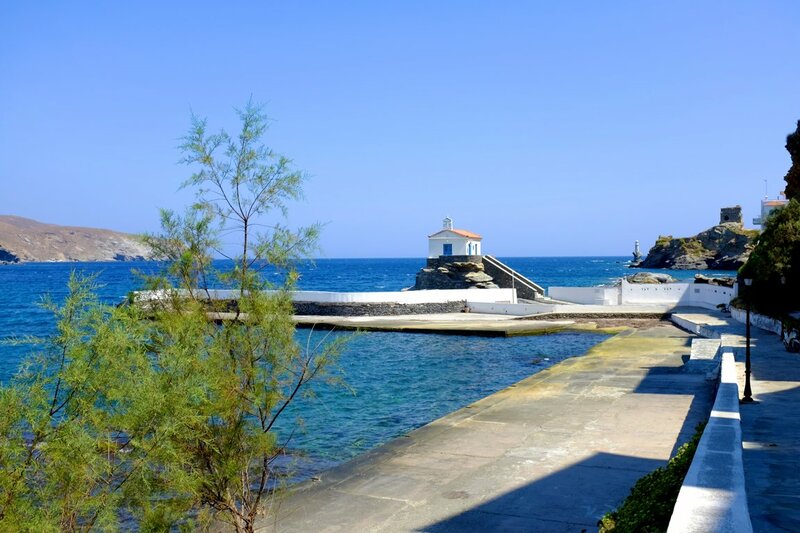 In Andros we have decided to stay in Gavrio - the main port. 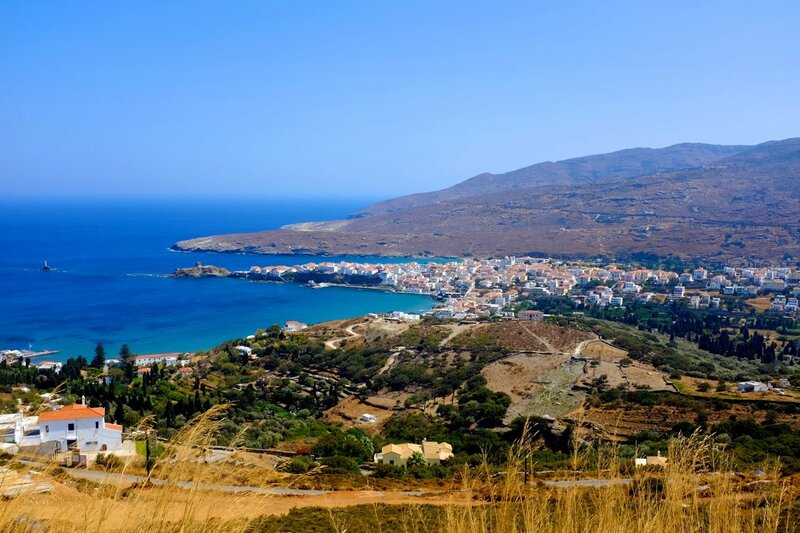 It's a very lovely village, perhaps less attractive than classical Greek beauties but still with lots of charm. The most important places - the pharmacy and 2 bakeries. We are staying in airbnb - in a small house with a wonderful view. 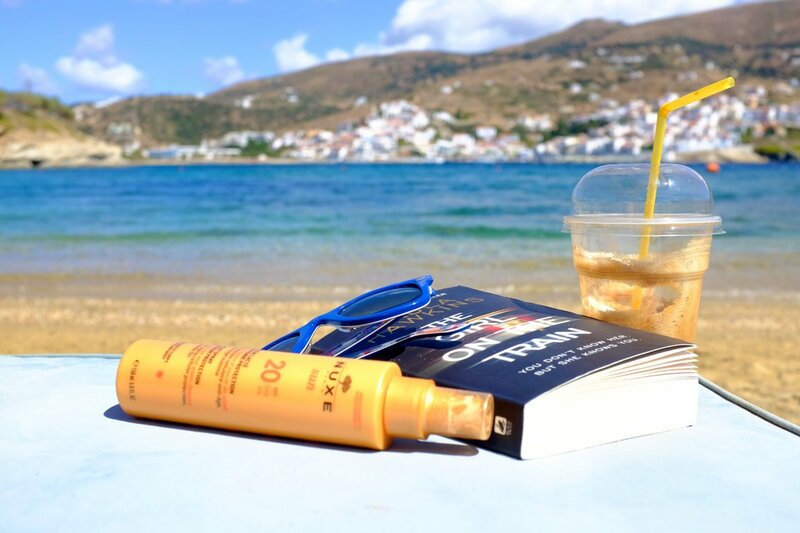 On our first day we are trying to figure out some swimming options and discover the best frappes and pittas in town - yes, it's confirmed - we love Greece. Apparently there are also many art galleries and museums but we leave them out. While being in Chora we notice that on each bank there is a little white church, we opt to check out the one the left - Holy Triad. And we are not sorry for our choice - we feel like we are at the end of the world (it's quite windy already) and the views... Jeeez... beautiful! To our surprise, meltemi winds are ruling the island for all the coming days. Normally it's windy up to 3 days but locals say that they have never had so windy summer before. And when I say windy, I mean really windy! So windy that it's impossible to sleep in our little lovely house on the hill... wind is howling and the palm trees are shaking and have a feeling it's the end of the world outside. But it's sunny and still warm, so we are ready to explore the island further. Fellos beach is very close to Gavrio and is protected from the crazy winds, around 9.30 there was not a single person there. 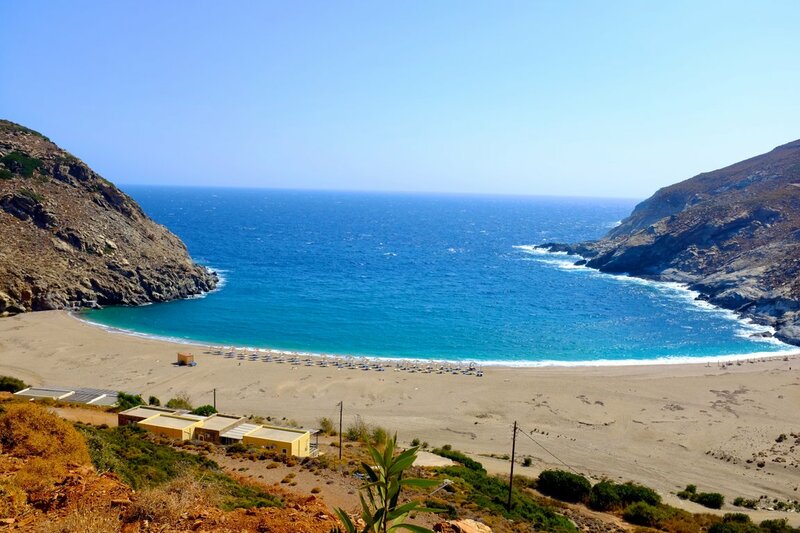 Our objective of the day - see Zorkos beach. Had seen amazing pictures before and our mission was to discover if it's really like that. And yes, confirm - stunning place. Because of the winds the sea was wild but it gave a very special feeling while being there. We take the opportunity to squat the seats for a while and just enjoy the power of nature. We also had a lovely walk - the passage on the right - wonderful views and can hear waves crashing. The restaurant was very good too - what a view! 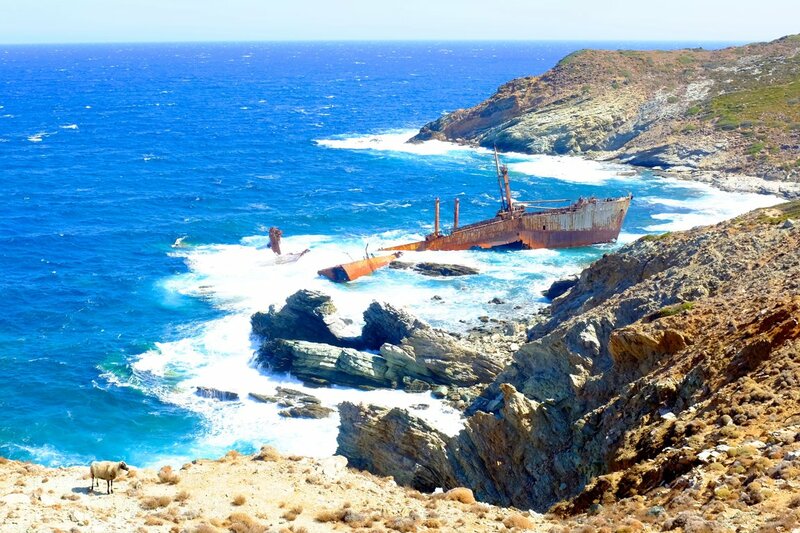 Our next day's challenge is to find the shipwreck - Semiramis. 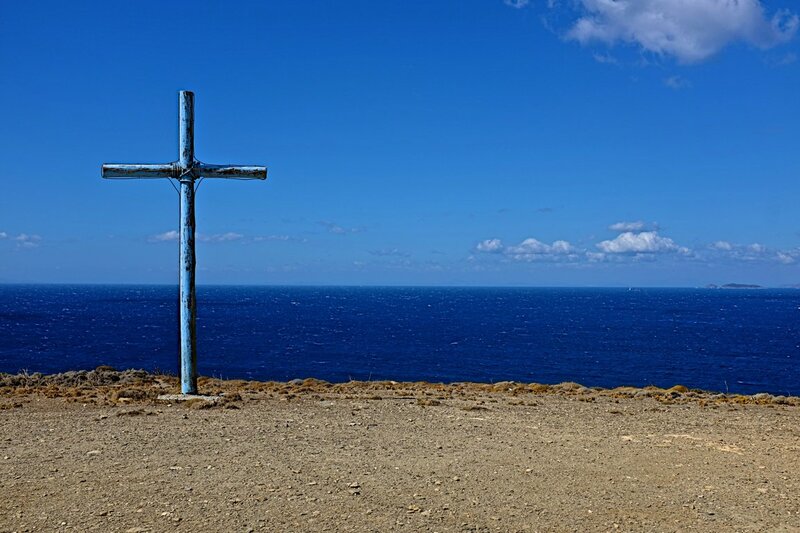 According to the map we would get there if we got to the Vori beah - the drive is around 1,5 h, the road is beautiful and completely empty, the valleys are getting lush green and we notice many tiny chapels around Vourkoti. The valley also has many bee hives - now we know where Andros honey is coming from. 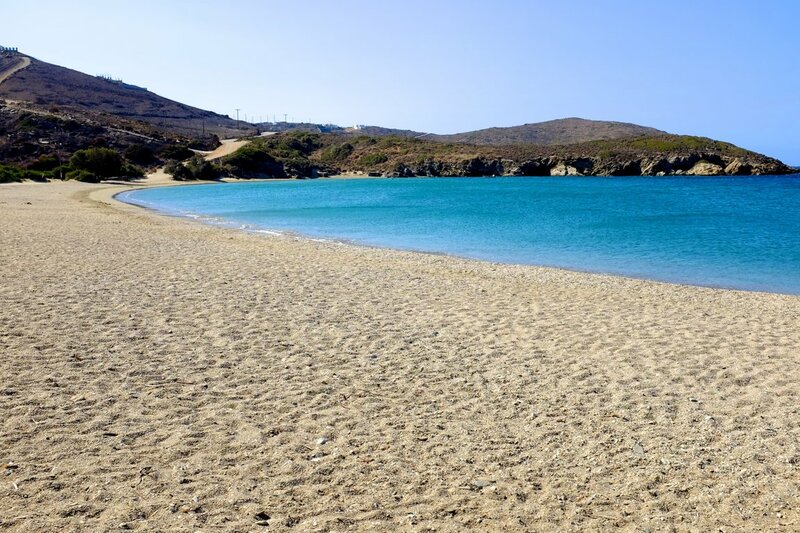 Vori is a lovely beach, feels completely forgotten at the end of the world as we are all alone again. To our surprise the road which was supposed to lead to the shipwreck is not really a road, just a small passage which is crossed by a small river... hm... next 30 minutes we spend speculating if our 4x4 can actually manage to cross it... we think that the shipwreck should be "just around the corner" but one can never know... Finally we launch ourselves into the adventure, we cross the little river (oufffff) and go up... the road is very bad and I have a feeling that we will fall off the rocks... so we decide to walk to the shipwreck instead. After a short while we get the wowwwww effect! It's there! The sea is spitting white foam, there is a complete silence apart from the wind howling, a completely surrealistic feeling. Semiramis itself is impressive. In calm whether you can probably approach it from the sea easily but we get a spectacular nature show instead. After all the driving we decide to spend a quiet afternoon in Batsi. The village is very pretty - the waterfront, small restaurants and a small port. For days we have also noticed a navy boat which just stays there... Is it for refugees? Training? We don't get any answers. In the evening we manage to get to O Kossis restaurant - it's a local farm which produces their own meet and vegies. It was wonderful, so good that I even forgot to take pictures! It's a bit tricky to find - so here is a link for you, it's also closed during weekend. 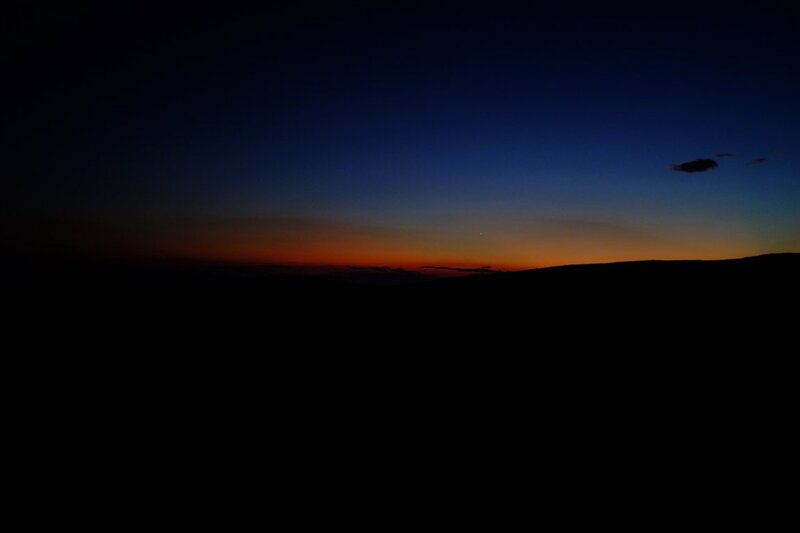 From there it was also our best place for a sunset - the only one we saw in Andros. The next day is our last day with a car, so we decide to explore the Western part of the island. Some crazy driving but the views - all worth it! 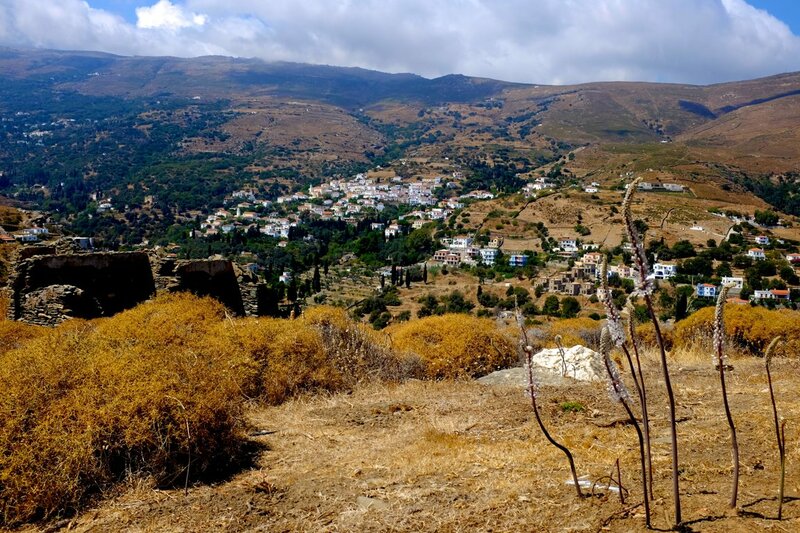 Our main goal was Παραλία Βλυχαδα but we managed to see much more thanks to the fact that we also got a bit lost. And again - the beaches were for us alone! While driving our attention was drawn by a fish farm and the area around it - so we just explored it. The chapel on the hill was impressive, so was the wind... We really had a feeling we would end up in sea. On the way we also saw many posh houses - some already made, some half made, probably for rich Athenians. However we did not see any construction going on, everything was left just as started - crisis or wrong season? For the whole week we were very attracted by a beach which we saw every morning across the bay, so we decided to explore it. Clearly this side of Gavrio was the "rich" one as lovely houses with huge fences like small legos sticked to the mauntain. The old lighthouse was a treat for our eyes too. Bit it turned out that this wild corner of natural beauty is also a local waste area... of course, hidden from the main tourist trails but what a disappointment that the local authorities allow this to happen. 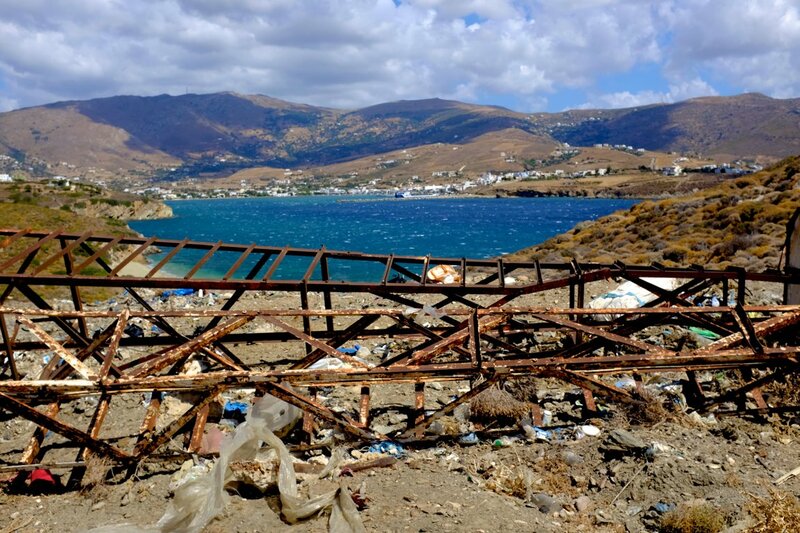 Our holidays in Andros are finished and we are heading back to Athens, this time with Fast Ferries - they are smaller than Golden Star and far less comfortable. 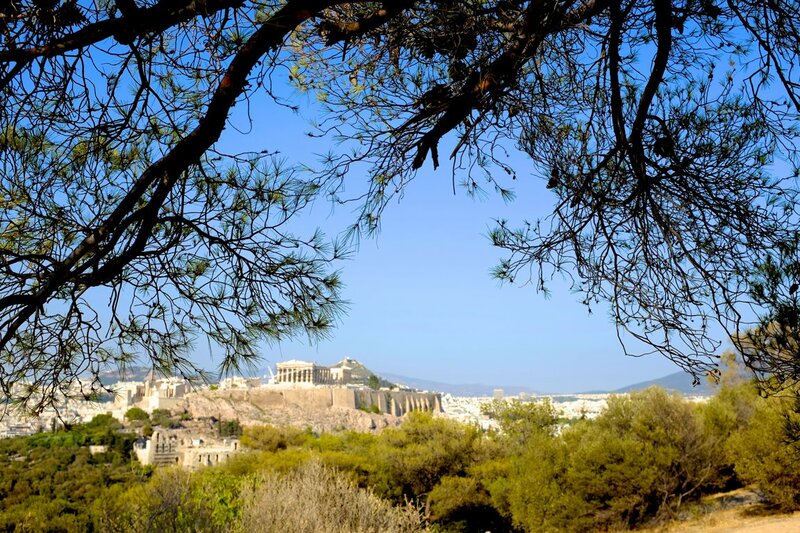 Athens is always a treat for us. We just love this city - it's perfect chaos, its colours, smells and overall vibes. We are staying again in Monasteraki area, this time in Stelio's airbnb - wonderful place, so well located. As always, we made a tour of our favourite places - the central market, around Acropolis, Monasteraki, Kolonaki, also went to the Byzanthian museum - quite nice but very messy with weird directions. And of course, Psirri with its graffiti and wonderful food is always on our list. However, this time I had a feeling that there were far more drug addicts on the streets or was I paying more attention now? And as always - time is too short for Athens. Did I already mention this? 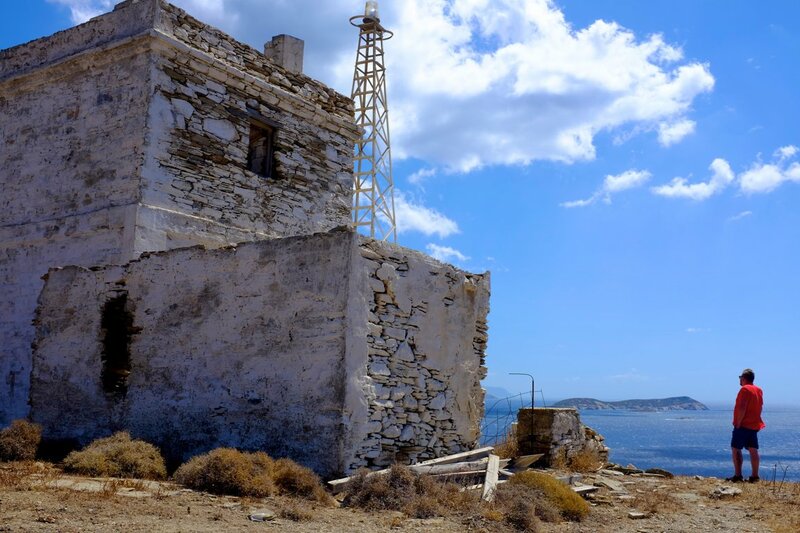 Read about our other trips to Greece here: Milos & Santorini in 2014, Milos and Athens in 2015. - This year we also discovered super tasty cherries in syrop. You can get them in bakeries. They usually serve them with Greek yoghourt and ice cream but very good for pancakes too! 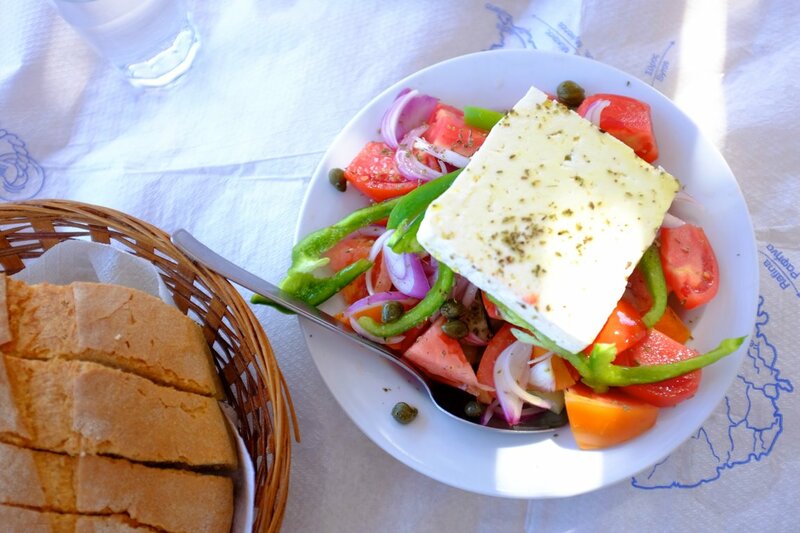 - I'm always amazed how tasty tomatoes are in Greece. 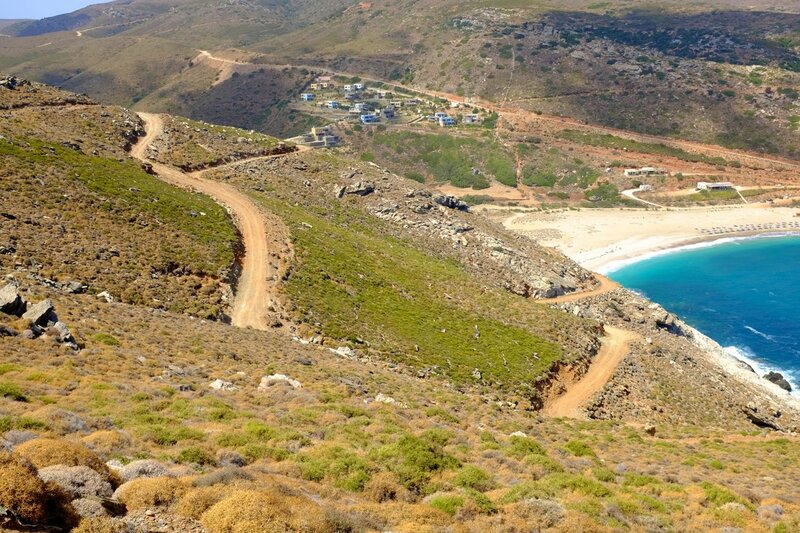 - Andros roads seem to very very steep, it's true but they are manageable and it much better condition than in Milos. - Gavrio is amazing for star watching. From our little airbnb we could see Milky Way! - Athens is so full of lovely designer shops for home items, treats for eyes! - And their beed shops next to Ermu street- they are amazing! 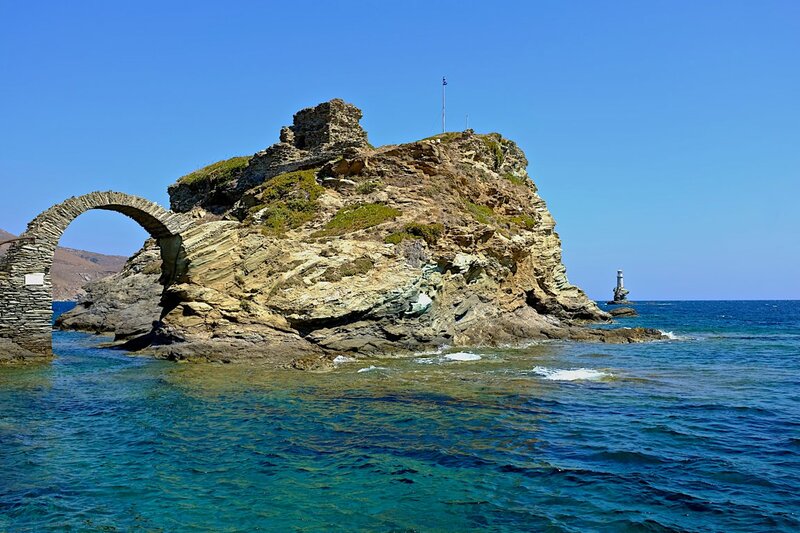 I was on Andros for four days October 21-24. Did you spend most of your time on beaches and near the coast? 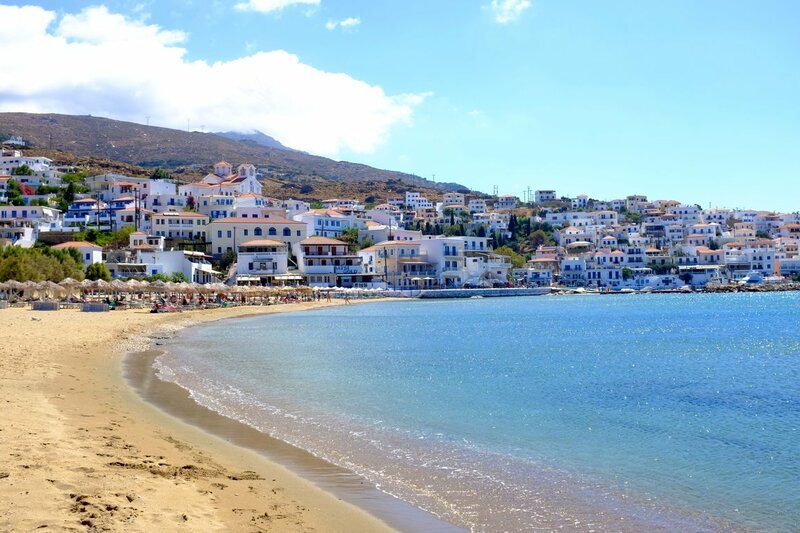 I stayed in Batsi and found it pretty but nothing special as other seaside villages I've been to in greece. I did a lot of exploring all over the island including many Mt. Roads and villages. Didn't get quite the impression that many of the Villages were well kept and pretty as on other islands. I thought Andros not as unexpected but still had a good time. 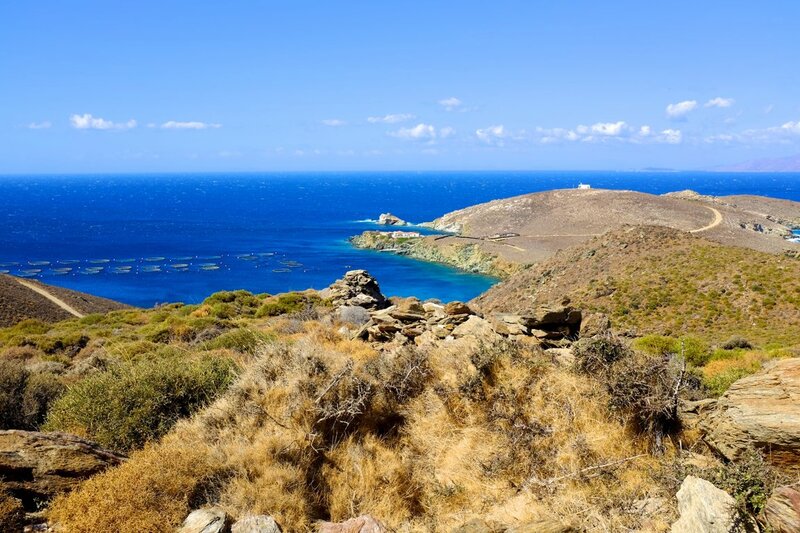 I was on tinos before Andros and it was spectacular. 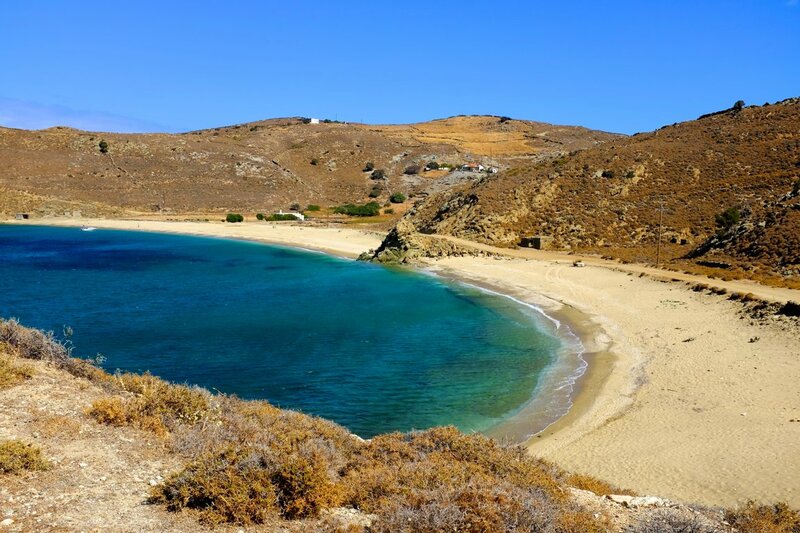 Complete opposite of Andros and highly recommend for your next trip to greece. If you enjoyed your time on Andros that's all that matters, regardless of my experience there. 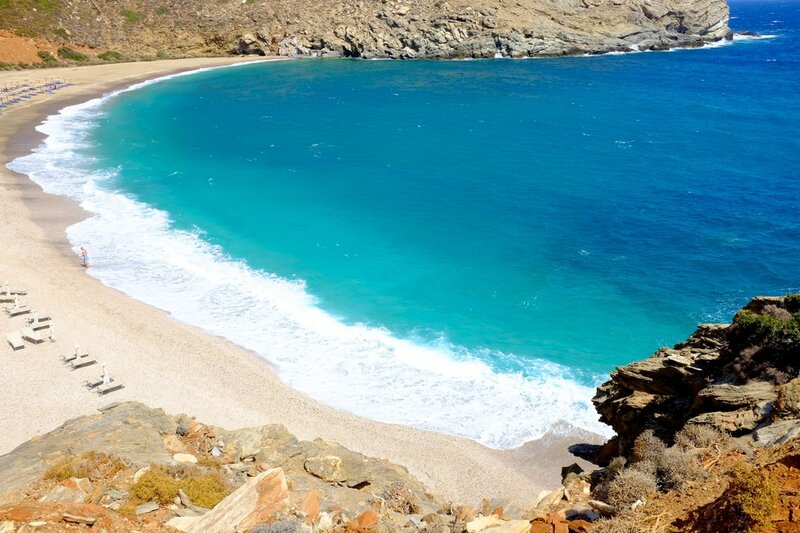 Great report from one of the three Cycladic islands I still have left to visit. 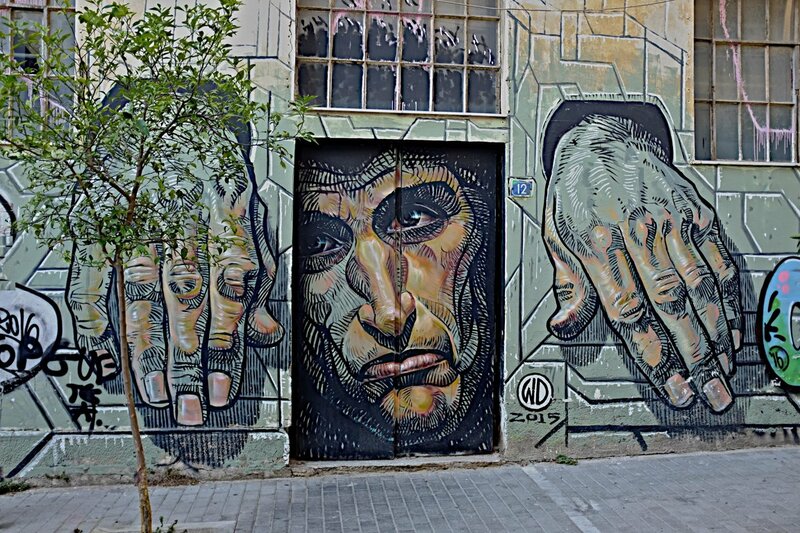 The street artist in Athens, GW, have made som really great paintings in Naxos . In the hotel ruin at Alyko beach.